President Bush hails from New Haven, Conn. President Truman grew up in Independence, Mo., and President Jefferson was born in Shadwell, Va. The Elks hope that in 2036, our nation’s President calls Islip, N.Y. home. To help youth learn more about public service, Islip, N.Y., Lodge No. 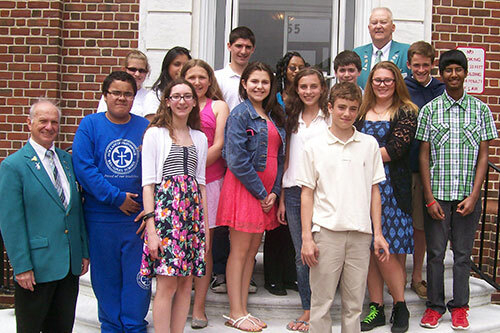 2533 used an Elks National Foundation Promise Grant to teach middle school students about Islip’s local government. The Elks and the students explored Islip by meeting with the town supervisor, visiting Town Hall, and touring local facilities like the airport and the recycling center. After their educational morning, Elks treated the students to lunch in town, where they talked about what they learned on their trip. The Elks National Foundation awards $2,000 Promise Grants to the first 500 Lodges that pledge to host an event that helps build the character and competence of local youth. To find out more about Promise Grants and the Community Investments Program, visit www.elks.org/enf/community.